considerations rather than on existing law. It is sometimes used as an antonym of judicial restraint. 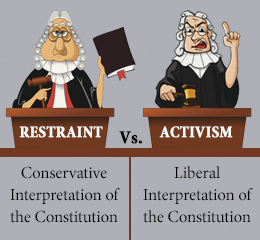 The definition of judicial activism, and which specific decisions are activist, is a controversial political issue, particularly in the United States. The question of judicial activism is closely related to constitutional interpretation, statutory construction, and separation of powers. Black's Law Dictionary defines judicial activism as a "philosophy of judicial decision-making whereby judges allow their personal views about public policy, among other factors, to guide their decisions." 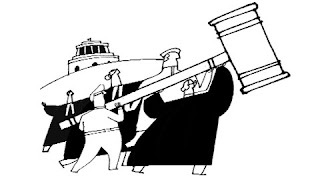 Judicial activism means active role played by the judiciary in promoting justice. The following trends were the cause for the emergence of judicial activism — expansion of rights of hearing in the administrative process, excessive delegation without limitation, expansion of judicial review over administration, promotion of open government, indiscriminate exercise of contempt power, exercise of jurisdiction when non-exist; over extending the standard rules of interpretation in its search to achieve economic, social and educational objectives; and passing of orders which are unworkable. The Supreme Court of India is the highest judicial forum and final court of appeal of India established under Constitution of India, as per which Supreme Court is the highest constitutional court and acts as the guardian of Constitution. India follow the integrated and yet independent judiciary. Since independence, judiciary has been playing a very active role in dispensing the justice since A K Gopalan vs State of Madras case (1950) followed by Shankari Prasad case, etc. However, judiciary remained submissive till 1960s but its assertiveness started in 1973 when Allahabad High Court rejected the candidature of Indira Gandhi and introduction of PIL by Justice P N Bhagwati further expanded its scope. Subodh Markandeya well known Senior Advocate of Supreme court of India is famous judicial activist, who is famous for his notable Public Interest Litigation cases. In the Privy Purse case Madhav Rao Jivaji Rao Scindia v Union of India the broad question was whether the President rightly exercised his power in de-recognising the princes. In this case, the court ruled that by virtue of Article 53 of the constitution, the executive power of union vested in the President must be exercised “in accordance with law”. That power was intended to be exercised in aid of, not to destroy, the constitution. An order merely “de-recognizing” a ruler without providing for the continuation of the institution of his rule – an integral part of the constitutional scheme – was therefore plainly illegal. In R C Cooper v Union of India, the legislative competence of Parliament to enact the Banking Companies (Acquisition and Transfer of Undertakings) Act, known as the Bank Nationalisation Act, was in question. The court struck down the Act primarily on the ground of unreasonableness, explaining that the restriction imposed on the banks to carryon “non-banking business” in effect made it impossible for the banks, in a commercial sense, to carry on any business at all. In Golaknath v. State of Punjab, the Supreme Court while dealing with the constitutional validity of the 17th Amendment to the constitution evolved the concept of “prospective overruling” and held that Parliament had no power to amend Part III of the constitution, or take away, or abridge any of the fundamental rights. In the fundamental rights case Keshavananda Bharti v State of Kerala, 1973 the Supreme Court rendered a judgment that can be regarded as an important milestone in the Indian constitutional jurisprudence. While dealing the question as to the extent of the amending power conferred by Article 368 of the constitution, the court evolved the theory of “basic structure.” A bench of 13 judges held by a majority of 7:6 that the Parliament had wide powers to amend the constitution extending to all articles of the constitution, but this power could not be used in an unlimited way to abridge, abrogate or destroy the “basic structure” or the “basic framework” of the constitution. poor and the indigent and the right to be represented by a lawyer. It was also held that the right to be produced before a magistrate within 24 hours of arrest must be scrupulously followed. implementation under Article 32 of the constitution. The court directed the government and the concerned authorities to ensure compliance with the laws in respect of workers connected with the construction work of the ensuing Asian Games in Delhi. In A R Antulay v R S Nayak , the court, while dealing with the question of prior sanction for prosecution of a public servant, held that an MLA was not a ‘public servant’ within the meaning of the relevant clauses as he was not remunerated by the fees paid by the executive in the form of the State Government.